A few days ago, I bought a bag of Nestle’s Dove milk chocolate candies, because the store ran out of the chocolate I usually buy. It was the first time I tried Dove chocolate, but once I tried it, I was absolutely hooked, because it was simply the best chocolate I’ve ever tasted. It was not too bitter, not too sweet, not to hard, and not too soft. In a word, perfect. I’ve taken a shower half an hour ago, but I decided to go along with the adventure and follow the advice. After all, I’ve been feeling a little stressed, and a bath could really help me relax. 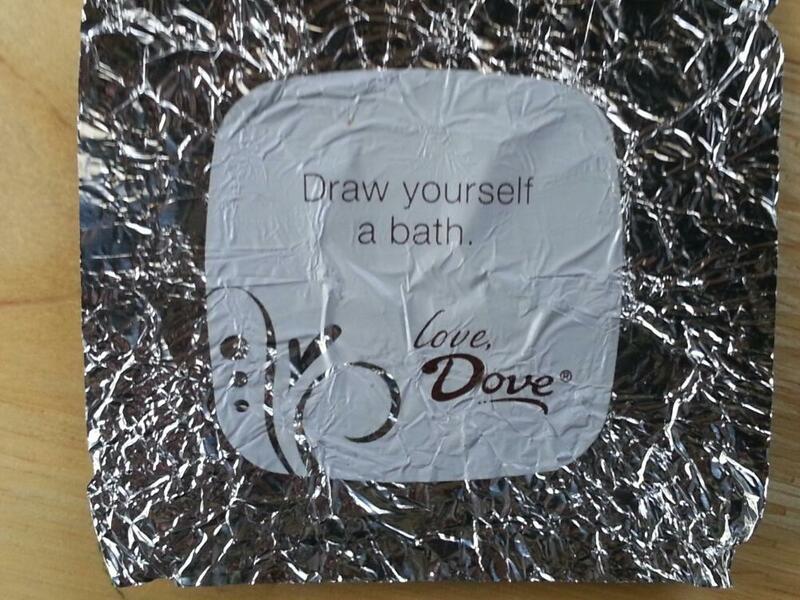 As I looked at the wrapper once again, I realized that the message was ambiguous, and could mean either that I have to draw a picture of a bath, or that I have to fill the bathtub with water and take a bath. I thought of calling Nestle’s customer service to ask them for their advice on my dilemma, but since I had a few minutes before the tub was filled, I just grabbed a piece of paper and sketched a halfway decent picture of bath. I really should start drawing again, I thought, but I then noticed that the tub started overflowing, so I rushed to get into the water. I came out of the bath and got dressed. The clock was showing 9:22 am, and I was really late for work. I thought that if I’m so late already, one more candy couldn’t hurt much more, so I opened another one. …I woke up with a headache, and a pain in my chest and my throat. The candy must have melted in my throat, and the air thankfully reached my lungs before I had suffocated. I tried to get up, and started reaching for the candy bag, but I stopped myself. No more until I get to my car. I hurriedly gathered my laptop, lunch and the candy bag, and ran outside. I’m not sure what happened next. I remember that I started daydreaming about Zooey Deschanel and maybe I wasn’t paying my full attention to the road. All I knew is that silver Honda seemed to materialize just a few yards away in front of me when I finally noticed it; I swerved hard to the right to avoid rear-ending it, and my car landed into the ditch at the side of the highway. It took AAA over an hour to get to me. The truck pulled me out of the ditch, and the driver around it to see how badly my car was damaged. “You know what”, he sad, “You’re really lucky. I don’t see any damage, maybe some scratches, but that’s pretty much it. See if you can start it up.” I got in my car, and turned the key to start the car. The engine started, but it sounded somehow wrong. “Pop the hood”, said the mechanic. “Ah, looks like a couple of your spark plugs aren’t working. Maybe the contact is off somewhere, but there’s no spark.” His phone rang. “Hold on, gotta take this”. He answered his phone and went over to his truck to talk. I wasn’t sure how long I’d have to wait, so I found a candy bag and unwrapped another piece. “Do you have a lighter, by any chance?”, I asked the tow truck driver. Without interrupting his conversation, he nodded and pulled out a lighter from his shirt pocket. I took it out of his hand, mouthed “thank you” and walked back to my car. The hood was still open. I leaned over the place where the mechanic pointed the spark plugs. As I clicked the lighter, I vaguely thought that may this isn’t the right place to light the fire, but it was too late – the air under the hood suddenly burst into flames, and, startled, I fell down on the pavement. It was almost 4 pm when I finally made it to the office. AAA ended up towing my car because some important stuff had burned out under the hood. I wasn’t at all surprised when I got called into the boss’ office almost immediately. I tried to explained my late arrival to my boss by telling him about my day of following the Nestle’s advise, but he was having none of it. For some reason, he felt that the idea of taking orders from chocolate was ridiculous. I wanted to show him that the messages aren’t ridiculous at all. To prove my point, I took out another candy and showed him the foil wrapper. I glanced at my watch. Without my car, it would take a lot of public transportation and a lot of walking to get to the nightclub, so to be the first on the dance floor, I’d have to leave right now. “Sorry, boss”, I said. “I need to go”. “What the hell do you think you’re doing…” screamed my boss, but I did not hear the rest of his speech since I was already running down the hallway. I made it to the nightclub around 8. No one was there, so I slipped a couple of $20’s to the bouncer to let me in and dance. I danced for a while by myself, and when I felt tired and took a break, I decided to check the messages on my phone. There was a text message from my boss: “If you’re late again tomorrow, you’re fired”. That didn’t sound good. I thought I better get home and go to sleep early so I wouldn’t be late tomorrow. It was a long walk home. I felt hungry, and I realized that I’ve been eating nothing but Nestle chocolate since morning. All the restaurants on the street were closed. 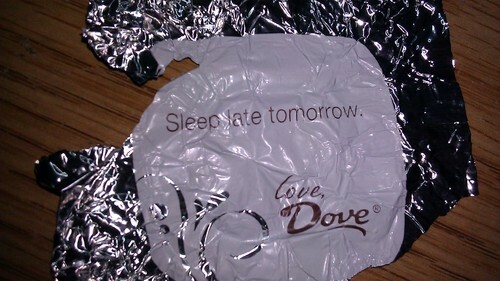 The almost empty bag of Dove chocolate was the only food I had. Just one, I thought, just to get home. I made a promise to myself, I thought, and so I didn’t set the alarm for tomorrow. Next morning, as I was riding my bus to work, my phone buzzed. It was a text message from my boss. My heart sank as I saw it, and I felt queasy as I opened it and read it: “You’re fired. don’t bother coming in”. “Next stop unemployment office”, said the bus driver. Might as well get off here now, I thought. I got off the bus, and went directly into the ugly brick building. As I was looking for a pen to fill the forms, I felt something rustle in my pocket. 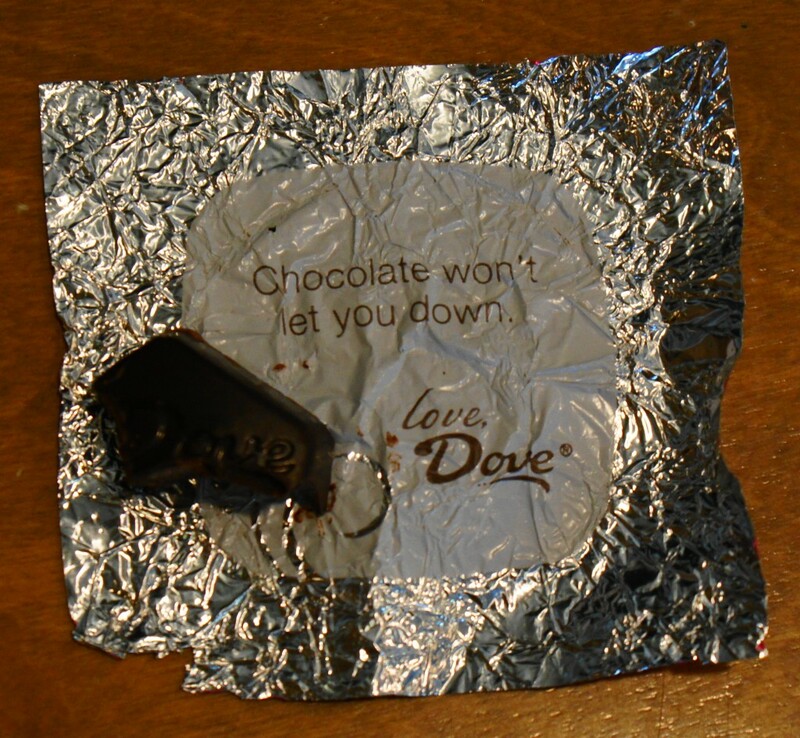 It was the Nestle Dove candy bag which looked empty, but when I crumpled the bag to throw it away, I felt something firm inside it. One last candy. Sorry, I thought, I’ve been following Nestle’s advice all day yesterday, and look where it got me – the unemployment office. But my curiosity got the better of me, and I read message on the foil. Ok. Not only Nestle chocolate made me lose my car and my job, and almost got me killed three times, now it was insulting me. 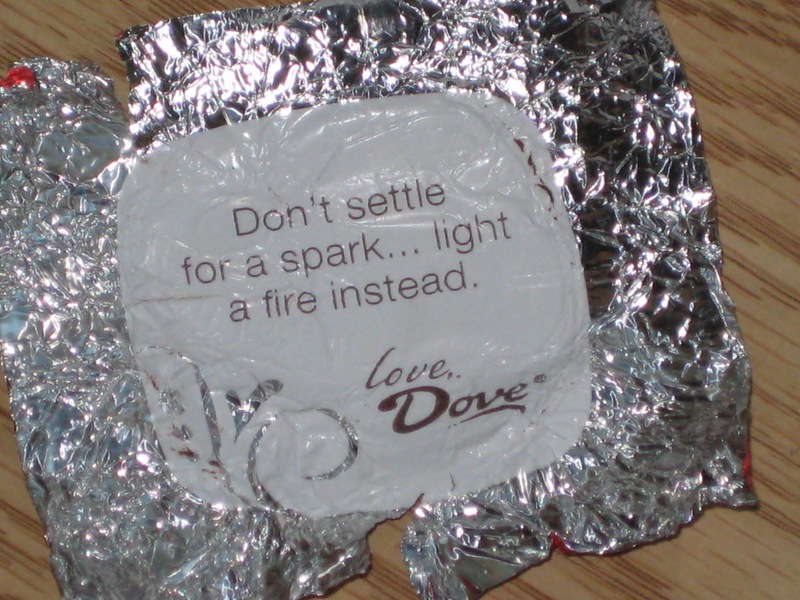 Damn you, Nestle chocolate, with your heavenly taste and your infernal advice. No way I’ll eat chocolate ever again. Whoever said that chocolate is good for you, is an idiot and should be hanged in the electric chair. OMG, you are right! 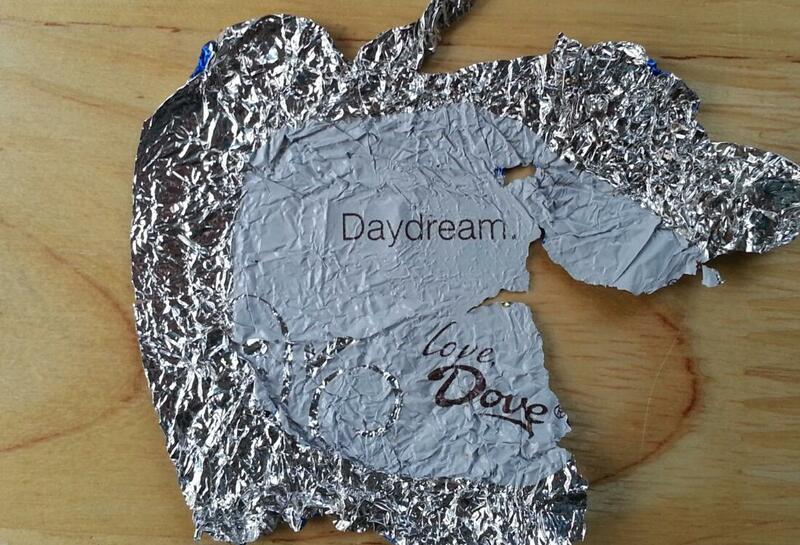 It’s Mars that makes Dove chocolate, not Nestle! And all this time, I’ve been blaming the wrong chocolate company for ruining my life! Hilarious! Also, I recognize some of those fortunes. They are recycling them! That can’t be good. Don’t ever buy a Magic 8-Ball… Just trust me on this. 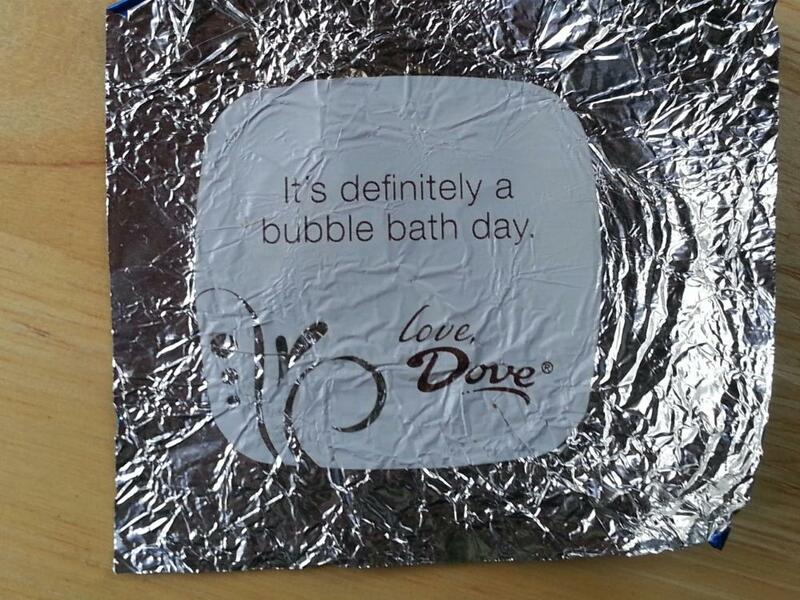 Dove chocolate wrappers never told me to buy a Magic 8-Ball. Hmm, maybe I should run for Congress. Let me see what Dove or Magic 8 ball have to say about that.